PHOTO BY REBECCA RAFFERTY Juan Carlos Caballero-Perez, 'Brooch Patterns" with sterling silver; 18, 22, and 24k gold; bronze, brown diamond, copper enamel, felt, stainless steel pins, and pearls. Imagine stepping into a dragon's den that's filled with its hoarded jewels. Everywhere you turn, surfaces gleam with precious metals and sparkling stones. Now picture this particular dragon has a penchant for organization -- instead of haphazard dunes of gold and precious crystals in a dim cavern, the dragon has carefully displayed each item to catch the gallery lights -- and you've got an idea of what Main Street Arts currently looks like. 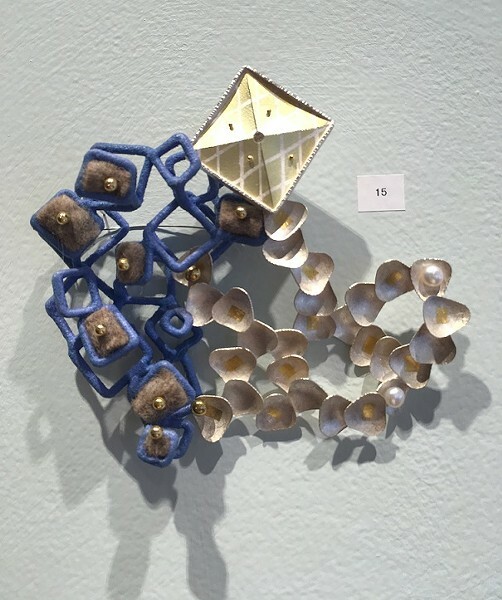 The Clifton Springs gallery is currently presenting "Multifaceted: An Exhibition of Fine Jewelry," featuring a clutch of gorgeous work by eight regional jewelry designers and makers: Erica Bapst, Boo Poulin, Karen Tretiak, Juan Carlos Caballero-Perez, Lynn Duggan, Colleen Griffin-Underhill, Marisa Krol, and Francesca Vitali. 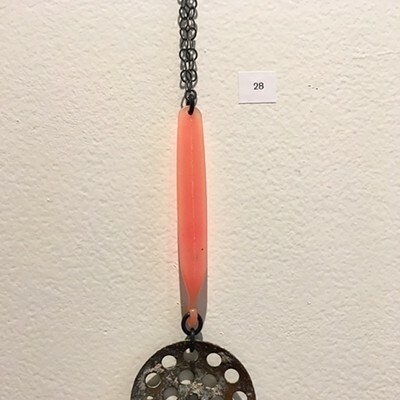 There's a smattering of jewelry presented in pedestaled cases throughout the gallery, but the vast majority of the work is displayed directly on the white walls, with some of the more dimensional pieces taking on a sculptural element and casting interesting shadows behind them. 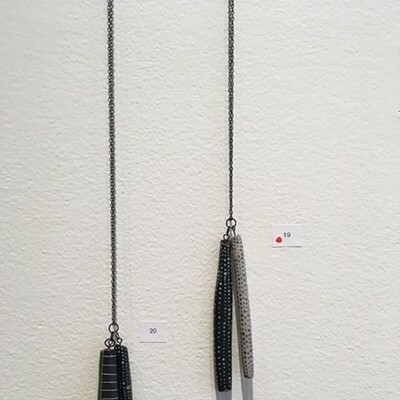 I also hang my small, personal collection of handmade jewelry from thin nails on the wall in my room, because it's just easier to find what I want in the morning. And it's also a cheerful reminder of the talented people I know who toil to make such delicate, lovely things with hammers and fire. 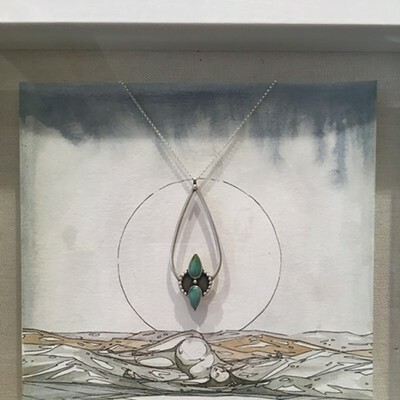 Gallery Director and Curator Bradley Butler says he wanted to get people to experience fine art jewelry as if they were looking at a painting or sculpture, and to consider the meaning behind each work. 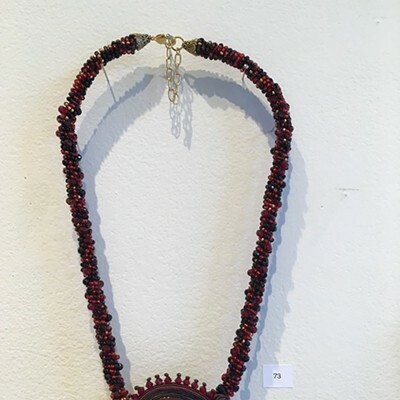 Having the unique and intricately-crafted pieces at eye level, open to close examination of the organic or geometric details and often surprising combinations of materials. Francesca Vitali combines folded paper and stainless steel. 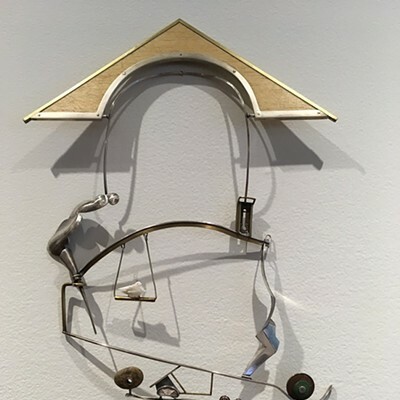 Juan Carlos Caballero-Perez mixes precious metals and stones with felt and glass to create fantastically balanced, otherworldly, elemental pieces that seem fit for a Venusian dignitary. 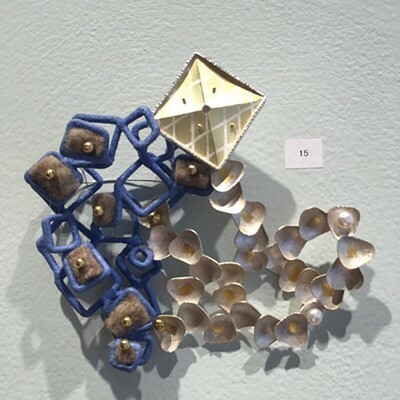 The fiber elements, precious metal version of sewing pins, and repeating patterns in his body of work is a tribute to his late mother's lifetime of seamstress work. 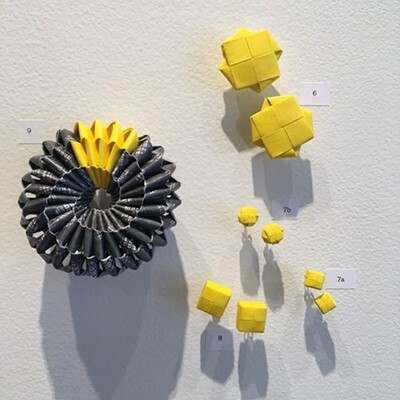 Much of the work is a simple, aesthetic celebration of form and material, featuring elegant tributes to natural minutiae or meditative expression of the creative self. 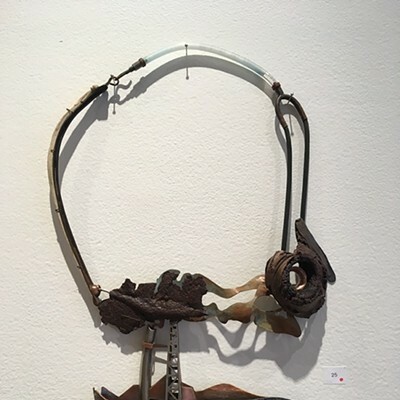 Lynn Duggan's work does this while also leveling criticism at social and political themes of gender, violence, and environmental concerns. Marisa Krol, who brands her work under the label Interstellar Love Craft, opted to go a collaborative route in presenting her work. 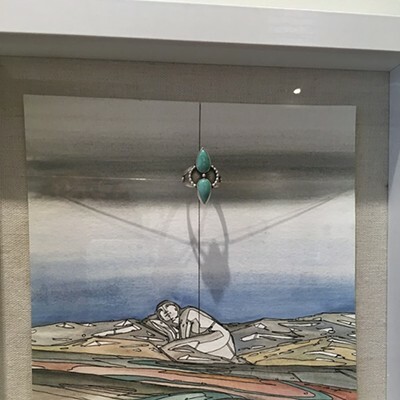 Each of Krol's four creations in this show are encased within a framed watercolor and ink painting by Andrea Durfee, whose images feature the forms of women embedded within sweeping landscapes. Suspended above the land and ladies, Krol's rings and necklaces read like beacons or sacred talismans in the sky. Below is a selection of images from more than 150 works included in the show, which continues through August 18. 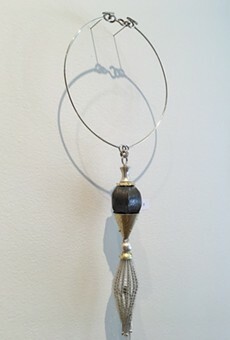 Slideshow "Multifaceted: An Exhibition of Fine Jewelry"